I live a kind of dual life. No, not in a Jekyll and Hyde sort of way, but as I work both with British and Italian clients/publishers, I often end up keeping these two sides of my work separated. I’ve often even wondered if I should have this blog in both languages, then I always assume that English is the international tongue nowadays and keep it only the way it is (or maybe it’s laziness…). Anyhoo, to try and set things right, today I’m introducing my latest characters, which I recently created for a comics page that runs once a month on the Monday edition of the Italian newspaper Il Fatto Quotidiano. 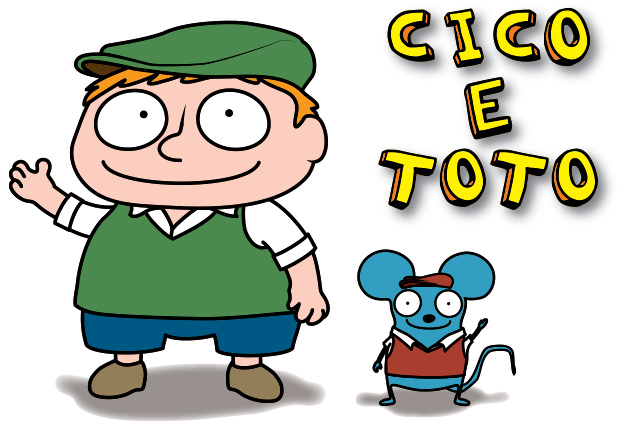 Cico [read “Chico”], is a child modelled on the newspaper’s logo (an old-fashioned newspaper-boy) and named after… myself (yep, that was my nickname as a kid and my sister still calls me that to this day); Toto is his friend, a mouse who lives in his house. It’s aimed at kids and it has very simple storylines, as they have to unfold and conclude in only 4 strips, but I really enjoy working on it and I find the effort to make a story work in the economy of one page quite a nice challenge.